The first record of occupation of this site comes from the 14th century when it was occupied by York house, the London residence of the Archbishop of York. It was in 1514, that the then Archbishop, Thomas Wolsey, occupied the house. As he grew in favour with Henry VIII, the King would often visit him here. But by 1520 the relationship between the two had begun to sour – Henry stripped him of his assets in southern England and the palace passed into royal ownership. At this time the Royal family didn’t have a residence in Westminster. The old Palace of Westminster had been destroyed by fire eight years earlier and the king had been living at Lambeth Palace. He seized his opportunity and embarked on a massive rebuilding programme to turn the Archbishop’s residence into a royal palace, adding extra buildings, a tennis court and a tiltyard. 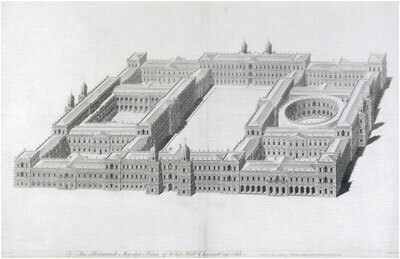 But at this time a banqueting hall was a temporary structure erected in the gardens when required. There is a record of one being erected for the marriage negotiations of Elizabeth I with the Duke of Alencon in 1581 and it seems at this time that somebody decided that perhaps it was more efficient not to keep taking it down and putting it back up again, but simply to leave in place and it remained on the site of the current banqueting hall for the next 25 years. In 1606 James I decided to remove this ‘temporary’ building and build a permanent Banqueting House, which opened in 1609. It lasted only 10 years before it was destroyed by fire. The new building was designed by Inigo Jones with ceiling paintings by Rubens. These were painted in his studio in Antwerp and shipped to London for installation in the Palace. There is no evidence that Rubens at she ever saw them in situ as he did not accompany them. The Civil War of 1642 to 1649 came to its great climax at the Banqueting House, chosen as the site of execution for King Charles I after he had been found guilty of treason. On 30 January 1649, the king was brought there from St James’s Palace, led up through the galleries and out through a window onto the scaffold. I can’t help but wonder whether there was some deliberate ploy in this to give him a final reminder of what had been as he experienced the lavishly painted galleries on the way to his place of execution. The Palace remained deserted for five years until in 1654 it was reopened as the residence of the Lord Protector, Oliver Cromwell. He lived here until his death four years later. 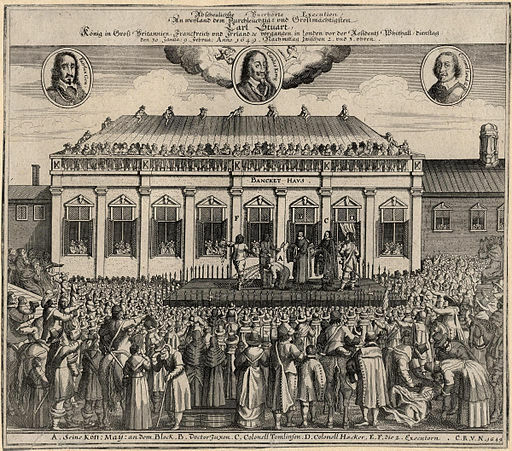 With the restoration of the monarchy in 1660, it is interesting that Charles II processed through London, ending up at the Banqueting House, where he received speeches of loyalty from the Parliamentarians. Was this in some way payback for what they had done to his father reminding them as they swore loyalty of that day in 1649 when they had killed the King? Charles’ successor James II was the last King who would live at Whitehall Palace. When the Crown was offered to William and Mary in 1689, the ceremony took place in the Banqueting House. 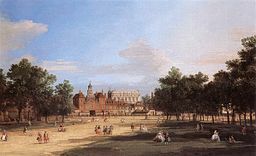 However, William, being an asthmatic, did not like living in the city of Westminster and moved the court his new palace in the village of Kensington. 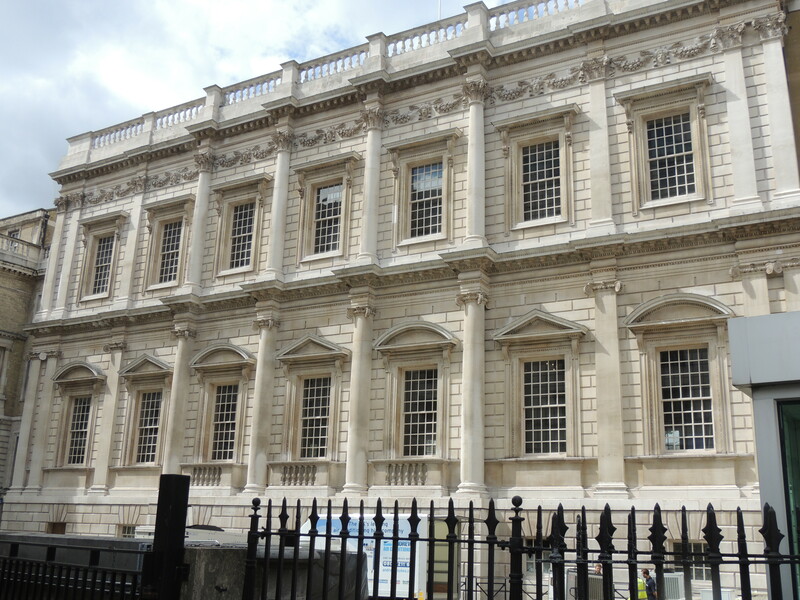 The Banqueting House was still used however for state occasions such as the lying in state Queen Mary in 1694. Part of the Palace had been damaged by fire in 1691 and in 1698 a major fire occurred which destroyed everything except for the Banqueting House and two gates. Sir Christopher Wren was commissioned to redesign the remaining building as a Chapel Royal and it remained as such until 1890, although from 1808 it was used as a Chapel for the Regiment of Horse Guards. In addition to its function as a Chapel, it was also used as a site for concerts. In 1829, the exterior of the building was dressed in Portland stone as we see it today. From 1893 the building was used as a museum, amongst whose exhibits was the skeleton of Marengo, the horse of Napoleon Bonaparte. The museum closed in 1962 and the building was restored to it’s Stuart appearance and reopened under the care of historic Royal palaces.